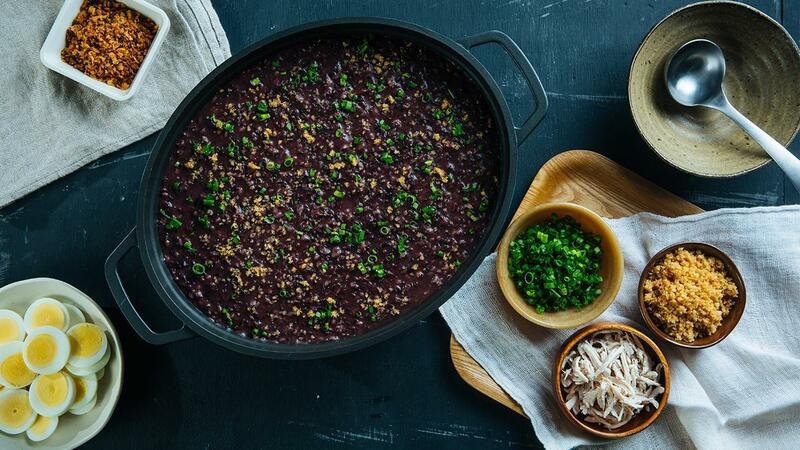 This version puts a healthy twist on a merienda staple by using black rice instead of white. The dark color creates a rich contrast against the garnish. Heat a heavy bottom sauce pot. Add the oil and saute the garlic, onions and ginger until fragrant. Strain the black rice from its soaking liquid. Add the rice to the pot. Add the water. Bring to a boil, then turn down to simmer. Add the lemongrass while the rice is cooking. Add more water if necessary or when the liquid has significantly reduced but the rice is not yet fully cooked. Garnish with shredded chicken meat, crushed chicharon, egg, spring onions and garlic chips. Best served with fried tofu and mushroom salad. See recipes on our website.